The survey Harris Interactive conducted on TRUSTe’s behalf in February 2011 of 1,000 US adults uncovered a wide array of findings about consumer smartphone usage, privacy concerns and behaviors, and their perception about mobile privacy in general. Major issues that surfaced centered around a perceived lack of control over how data is collected and used; unwanted or unwarranted location and behavioral tracking; and the desire for more specific, explicit privacy protections (in exchange for which, consumers might share more information). Only 1 in 3 consumers feel they controlled their personal information on mobile devices. 98% of consumers expressed a strong desire for better controls over how their personal information is collected and used via mobile devices and apps. When given the opportunity to control their data, nearly nine in ten smartphone users restrict at least some types of information sharing on mobile apps; resistance is even higher among BlackBerry users (who tend to be among the earliest adopters) and older consumers. 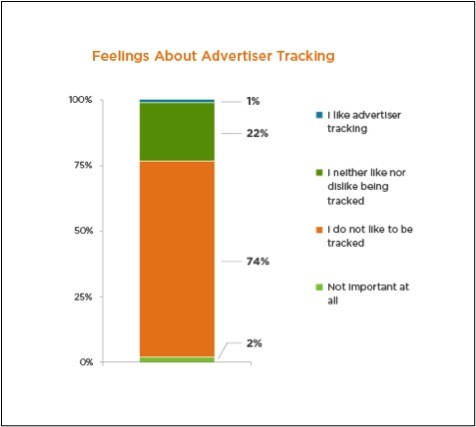 Nearly three-quarters of consumers are uncomfortable with the idea of advertiser tracking. 85% want to be able to opt into or out of targeted mobile ads. 68% believe they are being tracked for advertising (although the actual incidence of behavioral tracking is much lower). A minority of consumers feel they have a choice about the collection and use of their location information by an application, though iPhone users (at 45%) and Android users (41%) feel they have a greater choice in this matter than do users of other devices such as Windows Phone (38%) and BlackBerry (20%). 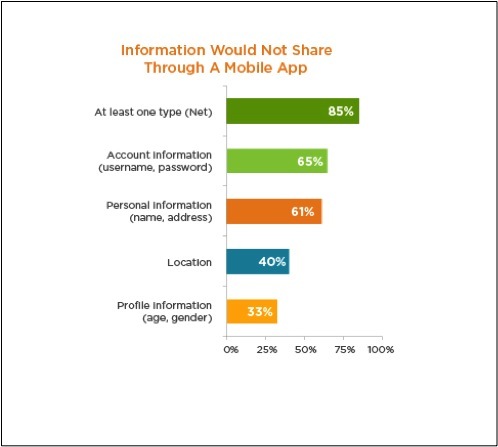 A significant majority (77%) of consumers don’t want to share their location data with app owners/developers (aka first parties). Only 2% are willing to share their data both with first parties and third parties. Consumers who receive alerts when location tracking is enabled (as iPhone users do) are more likely to allow access to location information when requested by an app. (iPhone users allow access about half the time, while Android users allow access about a third of the time). Consumers recognize the TRUSTe brand and share a strong consensus about the TRUSTe trustmark’s value in providing a sense of security for users visiting sites that display it, as well as the legitimacy of formal certification that its display represents on those sites. These findings speak to the need for mobile app owners to do more for their users if they truly want to keep their customers. I also think that other players in the mobile ecosystem have a role to play such as the app stores, advertisers and data collectors that use the information collected about users but that is a topic for another blog. To access resources on the topic of mobile privacy or learn more about TRUSTe’s mobile privacy certification program and how it can help increase trust among your mobile app or mobile web users go to www.truste.com/mobile. The full results of this survey can be accessed at www.truste.com/harris-mobile-survey.